his approach to Arctic off-roading at a concept level, but this snow-eating Subaru WRX STI is most definitely for real. The 400bhp TRAX was built by Subaru Rally Team USA's technical partner, Vermont SportsCar from a rally-prepared 2009 WRX ST. EXE-TC Group N competition rally dampers were added, the drivetrain lowered three inches and the wheels tossed in favor of a Mattracks rubber track system. Driving what must challenge for the title of world's fastest snowmobile is a 2.5-liter, 4-cylinder, turbocharged, intercooled STI engine that puts out around 400 horses and 400 lb.-ft. of torque. This is married to a KAPS 5-speed close-ratio dog-engagement gearbox and the Subaru programmable DCCD (Driver Controlled Center Differential) all-wheel drive system. So you've got something to do in the back country, the TRAX STI also has a specially designed sleigh which can drag four people and their snowboarding gear up the slopes. And who gets to drive this beast? That gig falls to the man who envisioned it (and keen snowboarder), Ken Block. Looks like quite a ride. See it in action below and listen to what Block has to say about the TRAX at 0-60mag.com. 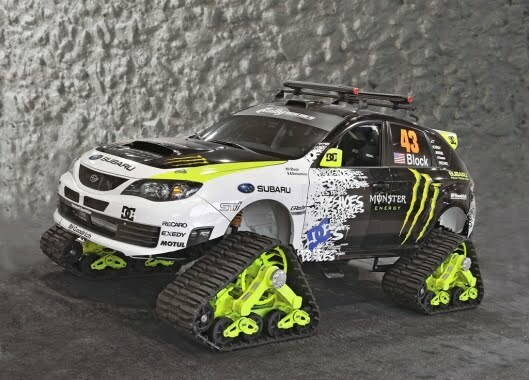 The Subaru WRX STI TRAX is on show at the 2009 Specialty Equipment Manufacturers Association (SEMA) Show in Las Vegas along with its polar opposite - the special SPT delivery van. Based on Subaru's 1969 micro van, the 25 horsepower, 10 x 4 foot, two-cylinder two-stroke achieves 66mpg, but it doesn't do it in a hurry.